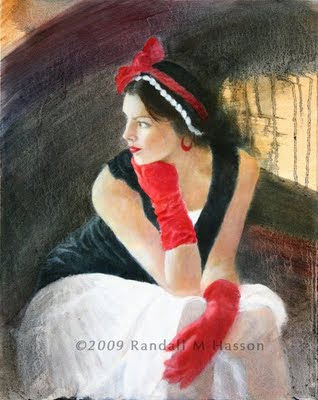 The Randall M. Hasson Blog: Newly Completed painting: "Holly in the Red Gloves"
Newly Completed painting: "Holly in the Red Gloves"
After taking quite a long break (much to the chagrin of my blushing bride) I have finally returned to the easel and completed one of my oil painting series. It is good to be back at the easel again, and happy to have the second painting already in progress! The model is my daughter Holly Rhoads. Stay tuned for more progress reports on the next portrait... see below! Randy, these are beautiful - as is your daughter! You're daughter is simply stunning in that painting. I wondered how many hours you painted this. And if she did complained for a back strain. Just curious. Hi Jessie... Thank you for your kind comments. The answer is that I paint from photographs or a combination of photographs... 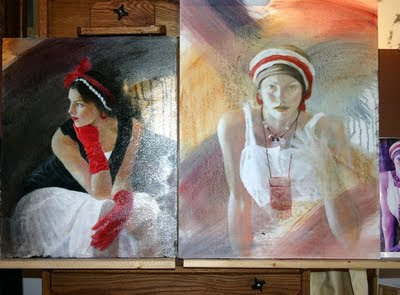 I will usually take quite a lot of time on a portrait, usually 3 to 5 days on the face itself.